As with Arches, we timed our visit to Canyonlands for a cooler part of the day - which meant that even though we'd had a late and restless night thanks to the storms, we were still up bright and early the next day. So early, in fact, that the clouds from the previous night were still hanging low in the canyons. Cat's goal was to make me as nervous as possible near cliff edges. Canyonlands is actually made up of four different park areas - Island in the Sky, The Needles, The Maze and Horseshoe Canyon. Of those, Island in the Sky is the most accessible without an off-road vehicle. Since we were in a Honda Civic loaded down with an extra few hundred pounds worth of my belongings, that made it pretty much our only option! Although it is not remote wilderness like the other areas of the park, the scenery was still incredible and there are still adventures to be had for those who would like to stay a little closer to civilization! We took the same tactic as at Arches and drove all the way through the park first, stopping at the Grand View Point Overlook. It lives up to its lofty name, with an expansive view including buttes, mesas and the canyon containing Monument Valley. We took advantage of a ranger-led talk on the geology of the region. Lots and lots of tourists passed by the talk without a second thought - but if you have a chance to talk with a ranger at the parks, I highly recommend it. Our ranger's excellent and interactive explanation of how the rock layers formed really changed how we looked at the landscape. We got to feel different types of rock and try to guess how they came to be. It is pretty impressive on its own, but once you understand the billions of years and all of the geological factors that had to come together to create this unique place, it becomes even more awe-inspiring. The sun came out during the talk, and by the time we hit the trail it was getting pretty warm. The Grand View trail led us another mile out to the edge of the canyon, to a point where we could look out in three different directions. 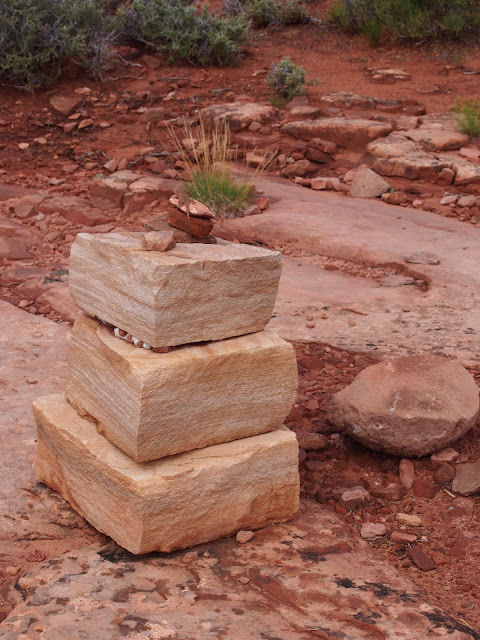 The trail was well marked with these cairns - this one was the perfect sunbathing spot for a little lizard! From there we headed back to Mesa Arch. It's close to the park entrance and just a 1/2-mile trail, so it was pretty packed with visitors. Some of those visitors were not particularly concerned with preserving nature (umm, what are you doing in a national park, then?) and were climbing on TOP of the arch for photographs - a big no-no given the delicate nature of the arches. We impatiently waited for them to leave, and were then able to enjoy the beauty of that spot with a few other respectful visitors. It's sad, but I think not unusual, to find people like that abusing the privilege of having access to this incredible place. What was particularly amazing is that Canyonlands is only a 30-minute drive from Arches - two totally different landscapes, so close together. And two totally different park experiences. Arches left me feeling electrified and alive and aware of the fragility of the world around us. Canyonlands, by contrast, had me contemplating how small the space and time is that I occupy on this Earth, and how massive and sometimes violent the forces of nature had to have been to create this serene place. "I want to ask you to keep this great wonder of nature as it now is. I hope you will not have a building of any kind, not a summer cottage, a hotel or anything else, to mar the wonderful grandeur, the sublimity, the great loneliness and beauty of the canyon. Leave it as it is. You cannot improve on it. The ages have been at work on it, and man can only mar it."